The UH-Fluor industrial conference, Construction-Driven Execution, was held at the University of Houston Student Center October 12. This inaugural conference brought together students from the Colleges of Engineering, Natural Science & Mathematics, and Technology for an exciting collaboration and real-world insights into construction-driven execution. Its mission was to promote a multi-disciplinary approach to engineering-procurement-construction projects - the future of industrial construction. ”The College of Technology was delighted to receive sponsorship and collaboration from Fluor Corporation. Moreover, for students, as aspiring engineers, technologists, and scientists, the benefits of direct interactions with industry through this collaboration are immeasurable. The knowledge gained through the sharing of “real world” experiences and design challenges provides keen insight into what will make our career-ready graduates successful,” said Dr. Anthony Ambler, dean of the UH College of Technology. The UH-Fluor partnership is a model for how industry and academia should interact, which is mutually beneficial. Fluor’s support extends beyond financial gifts, and includes significant amounts of time invested by Fluor employees who teach classes, host visits for our students, and organize monthly project management meetings to ensure that both sides experience the value of the partnership. Several experienced professionals from Fluor volunteered as organizers and speakers for the daylong conference, featuring Tricia Thibodeaux, global director of construction-driven execution as the keynote speaker. University of Houston alumnus, Dr. Aishwarya Mantha, global construction and fabrication coordinator and knowledge manager served as conference chair. Others shared their experiences in diverse areas such as advanced work packaging, performance solutions, project engineering, construction management, fabrication, and global construction automation integration. The conference highlights were presentations by the competition finalists who were awarded cash prizes. Dr. Ahmed Senouci, construction management professor and David Vogel, manager of the Houston Pipeline Department at Fluor, organized the design challenge, “Operation Restore Puerto Rico.” Students formed teams to design a power generation plant that would bring Puerto Rico back on track following its devastation from Hurricane Maria, which left residents in dire need of electricity. The design solution had to be cost effective and a constructible pipeline transmission system to move natural gas from the coast to the gas fired power generation facilities at a location central to the island near the city of Caguas. The winning first place team of construction management students, Sami Belaiter, Gabriela Salazar, and Brendan Reidy dubbed BSR Solutions, planned a new natural gas pipeline using innovative trenchless technology, augmented pipeline tracing, and drone mapping. 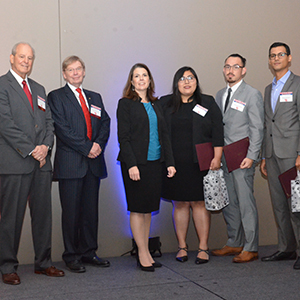 Two other teams took second and third place, respectively - Team E.B.C – construction management students Preston Hill, Monica Arredondo, and William Haase, a mechanical engineering student; and a team of construction management students - Nicholas Svatek, Elliot Logan, and Andy Felix.